Give your next fish fillet dish a festive Southwestern flavor with taco seasoning and some thick and chunky salsa on the side. Preheat oven to 425°F. 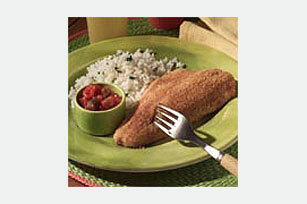 Moisten fish fillets with water. Shake off excess. Add taco seasoning mix to the coating mix in shaker bag. Shake 1 or 2 fish fillets at a time with coating mixture. Place in 15x10x1-inch baking pan sprayed with cooking spray. Discard any remaining coating mixture. Bake 12 to 20 minutes or until fish flakes easily with fork. Serve with salsa. Coat fish the night before, then cover and refrigerate until ready to bake. Uncover before baking.